Small, light and powerful wristband reader for RFID (UHF) tags with BT data transfer. 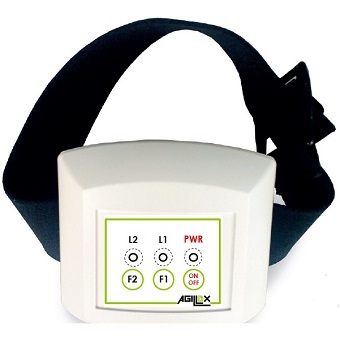 The AGX RadioForce WR100 is a light wristband reader (only 100gr) that allows to read & write UHF tags; easy to wear, with 3 configurable buttons, buzzer and 2 LEDs. The device can read up to 90cm distance with battery life that supports 10.000 reading or 14 h in idle mode. The AGX RadioForce WR100 can communicate in real time by Bluetooth / GPRS or perform the logging of data collected up to 5.000 tags. The AGX RadioForce WR100 support the following operating system: iOS, Android, Windows, Linux. The best in combination with PC, tablett PC, Smart Phone or iPad/iPhone! When paired to a smartphone or a tablet, the AGX WR 100 is a cost effective alternative to more expensive handheld devices. Designed for mobile operators in indoor or outdoor areas, the AGX WR 100 is ideal for in-store inventory management, field sales mobility, service and maintenance applications.